They say that kids the age of my kids don’t really play together so much as parallel play — meaning that they play next to each other but don’t interact much. That’s not true with my daughters, though. They interact a lot while they play now, from building structures together to collaborating on paintings to running some pretty raucous birthday parties. They use hilarious fake voices to converse amongst themselves when they are pretending to be their dolls and stuffed animals and to animate their cars and blocks. It is their most cooperative, their most social, and their most imaginative. Hopefully, Baby and Baby all got their share of cake. And Foxy Woxy and Pig and Funny Bunny and Sheep. We aren’t big on creative naming in my household. I suspect that identical twins develop the social skills to play together earlier than other kids. They also develop the combat skills; being an identical twin is a scrappy affair. I keep waiting for one of their teachers from school to call me with a complaint about biting, scratching, punching, hitting, or shoving. But so far so good. They seem to behave differently at school, a phenomenon which is probably related to the fact that they are in different classrooms. When we were scouting preschools, this one stood out for a lot of reasons, but one big one was the ability to put them in separate classes — not just an option but a mandate there. It has been wonderful. Suddenly, they have their own thing. Their own teachers, their own “friends,” and their own daily experiences. One classroom might focus on maple sugaring, while the other is doing pottery today. They do cross paths often during the school day — a phrase I use loosely since it’s really only 3.5 hours — in the playground, during all-school gathering. But I envision this as the start of their ability to carve out their own unique lives despite their identical DNA. This is the sort of thing that used to worry me about identicals, until I got into reading about epigenetics and how even two identical sets of DNA are not the same when manifested into an actual human being, which I can certainly attest to from witnessing my own science experiment in effect. DNA Is certainly just one of the many things that makes you a unique person. 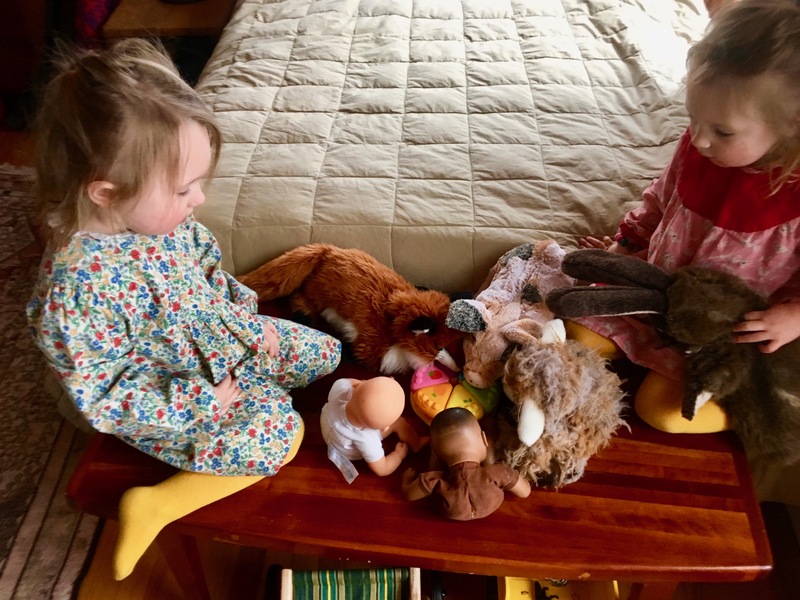 On the other hand, being same-gened is probably one of the main reasons my daughters are already engaging in parallel play with each other. They really get each other, in a way you and I have never been gotten by anyone. On a totally unrelated note, I finally figured out how to add an email signup widget to my blog! If you’re interested in getting an email notification when I post, please sign up to the right.